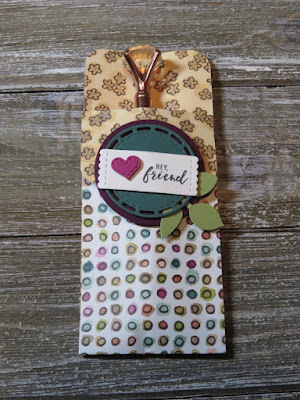 Karina's Kreations: Stampin'Up Stitched Labels Framelits Gift! Stampin'Up Stitched Labels Framelits Gift! It's easy to create cute handmade gifts with Stampin'Up products. I received this cute roommate gift from my friend Brett. Isn't it pretty and how cute is the pen. She used the Share What You love Designer Series paper cut at 2-1/2" x 12", scored at 1-1/2" and 6"creating a pocket. The pocket was sealed with Tear and Tape adhesive. 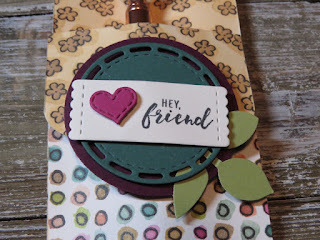 The pocket was decorated with the Stitched Labels Framelit dies and the Itty Bitty Greetings stamp set. Here's the supply list for the project.